If you continue to have problems with this RBL listing your IP, please contact us at support@mxtoolbox.com with your IP and domain name and we can manually update your account. This entry was posted in MX Alerts, MxWatch, Real Time Blacklists on February 27, 2009 by MxToolbox Blog. According to Spamhaus.org, Verizon.net is one of the largest ISP networks that allows Virus and Trojan activity on their Network. Verizon, however, says it plans to put measures in place to prevent it from being used as a home to so many spammers. 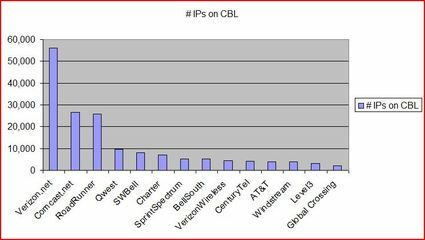 According to Security Fix Spamhaus currently includes 225,454 U.S. based Internet addresses on its CBL. Of those, nearly one-quarter — almost 56,000 — are assigned to Verizon.net. Fore more details on these findings and the plan that Verizon plans to take to combat this activity, visit the Security Fix website here. At MxToolBox we always encourage our customers to secure their network by locking down port 25 to only allow outbound traffic from their mail server and to test to make sure that their server cannot be used as an open relay. If you are listed on the CBL it is more than likely because of a virus or trojan that is sending out spam from your network without your knowledge. We would highly recommend installing Ad-Aware, Spybot Search & Destroy, and an anti-virus package in on all Windows workstations as well as the mail server. This will ensure that you are scanning for this activity and help prevent you from having an issue. If you still continue to have issues sending mail, we highly encourage you to contact one of our blacklist specialist which can tell you about our Business Enterprise Blacklist Protection Email Services. This entry was posted in MxWatch on February 18, 2009 by MxToolbox Blog. There is a report of a more serious (more serious than “usual”) flaw that has been discovered in Internet Explorer (IE). You can read about it by clicking on this link. 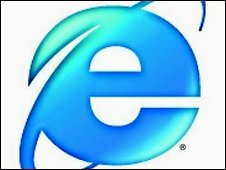 “Users of Microsoft’s Internet Explorer are being urged by experts to switch to a rival until a serious security flaw has been fixed. We highly recommend that you should use another Internet browser, such as FireFox at least until this bug is patched by Microsoft. Firefox should work for almost any website. When you install Firefox, it will ask if you want to copy over your IE settings, favorites, etc. – that’s safe to do. If you already have Firefox installed, you can go to File/Import to get your most recent IE settings copied over. You may be asked if you want to make Firefox your “default browser” – answer yes – you can always change this back to Internet Explorer later. The recommendation is to only use Internet Explorer if you need to access a website that isn’t Firefox compatible – some financial sites, Microsoft itself, etc. or others that don’t display properly in Firefox. This entry was posted in MxWatch on February 11, 2009 by MxToolbox Blog. We have received reports that the RBL (Real Time Blacklists) JAMM DNSBL has gone down. We have removed it from our database and no more alerts should be received. The JAMM DNSBL was a public data base which listed suspected sources of spam which has recently closed its doors. Most RBLS (Real Time Blacklists) when they wish to dissolve will commonly blacklist the entire internet in order to get the attention of those people using them to stop attempting to contact their IPs. We apologize for any inconvenience this may have caused, please let us know if you have any other questions or concerns. This entry was posted in MX Alerts, MxWatch, Real Time Blacklists on February 8, 2009 by MxToolbox Blog.